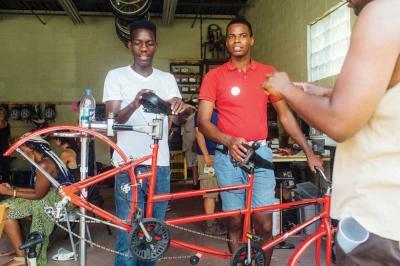 The Bowdoin Bike School has moved locations and the teaching and repair shop is now settled at 14 Southern Ave. in Dorchester, said founder Noah Hicks. After moving in barely 24 hours ahead of time, Hicks said they wrangled more than a dozen volunteers to get the shop in shape for their grand opening on Aug. 15. “We offer a bike shop alternative for not just people in Dorchester, but all over Boston,” he told the Reporter. Normal hours are Wednesday through Saturday, noon to 6 p.m. The school’s weekly bike rides will still take place, every Saturday after the shop’s close, Hicks said. The “slow roll” bike rides involve pedaling at a leisurely pace down Boston streets. This allows everyone to keep up, even the very young or very old, and offers the chance for nearby bike-owners to be inspired and join them, Hicks said. By following the Bowdoin Bike School on Facebook and Twitter, riders can keep up with planned rides and other bike-related news, he said. Another program in the works is the transformation of the former Uphams Corner comfort station into Bike Kitchen. Hicks, at the project’s helm, said they are still in the planning stage but excited to get started. Historic Boston, Inc. is partnering with Hicks on the venture. Hicks and his small staff are getting underway at their new shop, where they can actually earn the revenue to fund their programs themselves rather than relying mainly on grants and donors, Hicks said. Their end game is simple: more bikes on the streets and more happy bike riders on them.